The Islamic insurgency in Southern Thailand is ongoing and political and military leaders in Thailand appear to be at a loss because of many internal political and economic convulsions. Yet it is clear that radical Islamists desire an independent state and this state is meant to be Muslim to the core, and all Buddhists are deemed to be expendable. In Kashmir the Hindu minority was forced to flee because innocent civilians were targeted by Islamic jihadists and Serbian Orthodox Christians in Kosovo have witnessed the endless destruction of their Christian churches and culture. A similar pattern can be seen because Buddhists face daily fears and gradual Islamization in the Chittagong Hill Tracts in Bangladesh. While recently three Christian pastors in Northern Nigeria were beheaded by Sunni Islamists because they refused to renounce Christianity. Sadly, more harrowing stories can be stated about the burning alive of Christians in Pakistan by Sunni Islamists and the continuing persecution of all minorities. Therefore, Ahmadiyya Muslims face the sword of Sunni Islam because of conservative hatred in Pakistan and Baha’is in Iran face severe restrictions and bouts of false propaganda by central forces in Iran. At the same time Christians face either dhimmitude or pogroms in Iraq alongside other minorities like the Shabaks, Yazidis, and Mandaeans because radical Islamists threaten all minorities. In Southern Thailand the current Islamic insurgency is following a similar pattern and this pattern is based on the beheading of Buddhists, killing innocent civilians, killing teachers, and spreading darkness throughout Southern Thailand. Of course Islamists and others want to silence the mass media and many writers fear the shackles of editors or they are turning a blind eye because of political correctness. Therefore, we have ridiculous media attention about discrimination against Muslims with regards to being checked at airports or being denied dress freedom in France. However, does this really compare with beheading Buddhists in Southern Thailand or burning Christians alive in Pakistan? Also, remember that this is done in the name of Islam because these Islamists want an Islamic monoculture where they kill or persecute non-Muslims first and then kill fellow Muslims, like killing Ahmadiyya Muslims, because they are not deemed to be Muslim enough. Turning back to Thailand it is clear that Muslims in the south feel alienated from the central state and the economic infrastructure is weak. However, many Buddhists in Thailand also face economic hardship and grinding poverty in parts of this nation yet they do not go around beheading Muslim religious leaders. If Thailand doesn’t do more to respond to daily intimidation and the ethnic cleansing of Buddhists in Southern Thailand then clearly the situation is going to get even worse. It is also important to point out that radical Sunni Islamists in Indonesia and the Philippines, alongside global jihadists, could join the fray if this crisis continues to follow the same path. This hatred is inspired by Mohammed because he stated in the Hadiths to not only kill infidels (non-Muslims) but that Muslims will be rewarded for killing infidels. Therefore, Islamic jihadists in Afghanistan, Chechnya, Indonesia, Iraq, Pakistan, Thailand, or wherever, are directly following the teachings of Mohammed. Given this, Islamic radicalism in Thailand and other parts of the world is a serious issue because minorities are being killed by Islamic jihadists because of the fascist nature of this ideology. Zachary Abuza, author of Militant Islam in Southeast Asia (Crucible of Terror), and a host of other written material, highlighted the role of the madrasas (Islamic schools). Clearly it is obvious that many radical Islamists are being churned out in radical madrasas and national governments must either regulate these schools or provide an alternative system. If not, they will become a continuing breeding ground for killers of non-Muslims and Muslims alike, after all, the Taliban and Islamic indoctrination came through these radical Islamic schools and they had no qualms in killing Shia Muslims and other so-called Islamic heretics. Therefore, whoever controls the mosque or madrasas is in a powerful position. It must be mentioned that not all madrasas are involved in hate inspired indoctrination, however, many are out of control and you have a state within a state and of course Pakistan is paying for this now because they allowed this dangerous situation to happen in the first place. In modern day Thailand you have the false reality of stability in many parts of this nation and tourists from all over the world visit for various factors. However, in Southern Thailand you have a dangerous Islamic insurgency which beheads Buddhists, kills teachers, kills Muslims who are deemed to be loyal to Thailand, and other innocents. Sadly it does appear that Zachary Abuza is correct because this issue is neglected and since 2008 it is clear that this insurgency is growing once more because more attacks and killings have been reported. Therefore, the war within Islam is continuing because Islamic radicals are killing Muslims and Islamic leaders who are deemed to be infidels because they do not support the ongoing slaughter of innocents. At the same time Buddhists are living in fear and many have been killed in extremely cruel ways and of course many have fled this carnage. Sunai Phasuk, a political analyst at Human Rights Watch, commented that “Buddhist monks have been hacked to death, clubbed to death, bombed and burned to death.” Therefore, it is clear that this Sunni Islamic insurgency is following a familiar path and this applies to the destruction of all non-Muslim elements within society or the complete dhimmitude of all non-Muslims by the rule of fear. The ongoing Islamic jihad in Southern Thailand could draw in other regional and global jihadists, and this could have dire consequences because you have Christian-Muslim tensions in parts of Indonesia and the Philippines. Also, if the Thai army is forced to retreat or adopt a containment policy then clearly Islamic jihadists will gain because they will have free areas in order to spread their dangerous ideology and cause further mayhem throughout the region. At the same time the current Sunni Islamic insurgency hopes to cleanse the region of all Buddhists and to destroy Buddhist temples and architecture in yet another re-run of Afghanistan. Therefore, it is clear that the minority Buddhist community in Southern Thailand needs greater protection from radical Islamists. 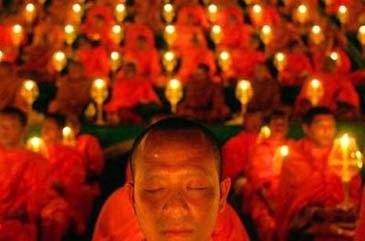 If political leaders in Thailand betray the Buddhist minority then the consequences will be severe. Also, this part of Thailand could become yet another museum where Buddhism is eradicated by Islam?